The emergence of 24 hour news has produced an insatiable need for talking heads and social commentators. Producers under pressure to deliver a package on the big topic of the day thank their lucky stars for the availability of an expert or representative. 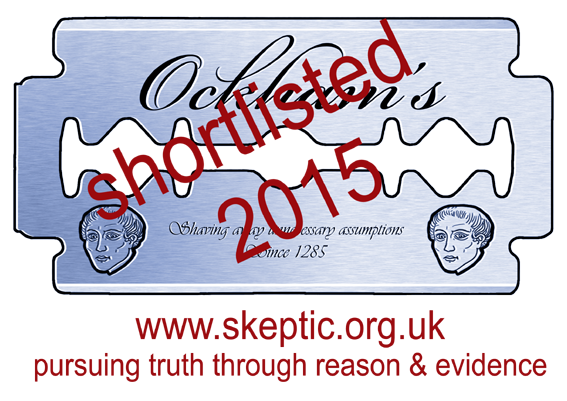 It’s become clear over the years that some are more available than others however. When choosing someone to speak on behalf of a community, it’s especially important that you do so carefully and carry out the due diligence on their CV. Many in the UK may be familiar with the mug of Mo Ansar for instance. 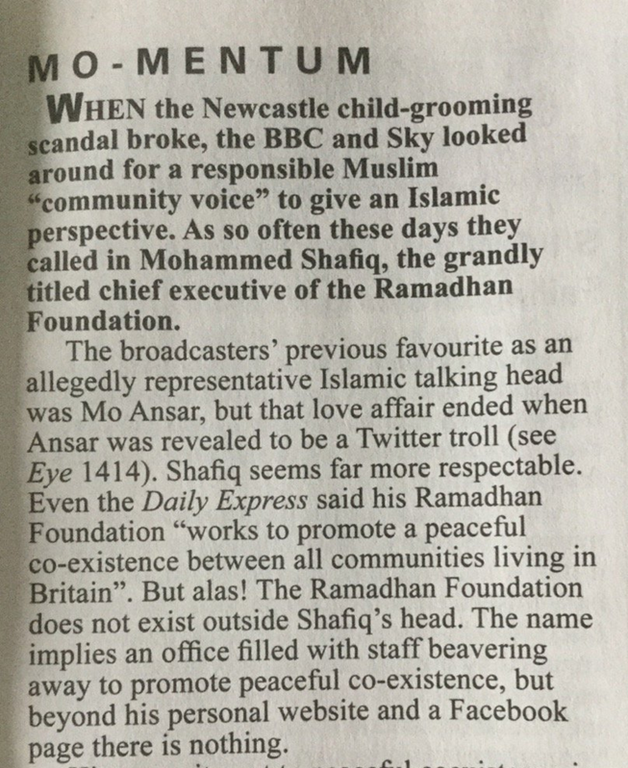 At one time he was the most prominent Muslim face in Britain’s media. Unfortunately for Mo, his celebrity unravelled when a few inconvenient observations about his credentials and proclamations finally caught up with him. Last I’d heard, those flowing religious garments that had been so important to his image had been ditched in favour of an earring and he’d embarked on a Brent-like adventure to make it in a band. Good luck to him, sure. 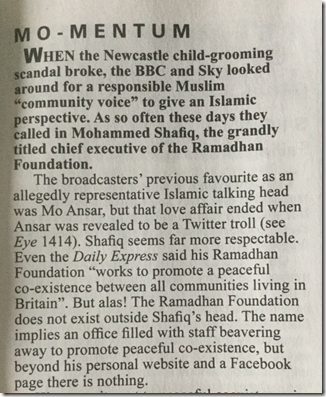 The man who has seemingly stepped in to assume the role of unqualified rent-a-mouth is Ramadhan Foundations’ Mo Shafiq. You can expect to see Mo Shafiq across several TV channels and print media whenever there is a terrorist atrocity. Which means business is booming. He is also available for gang rapes. I’ve raised questions about Shafiq’s questionable behaviour before, namely his support for blasphemy laws and the welcoming of hate preaching extremists to his local mosque. As if these facts were not sufficient enough to have his ‘moderate’ status revoked, he was also responsible for whipping up death threats against Maajid Nawaz and historian Tom Holland for the crimes of tweeting a cartoon and making a documentary, respectively. There is another issue that must also be addressed. 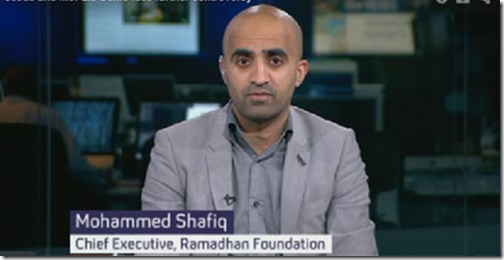 Whenever Shafiq appears in print or TV, he is always introduced as “Ramadhan Foundation’s Mo Shafiq”. This has had me scratching my head for some time. Where are the headquarters of this foundation? How many staff are employed there? What do they do? Where can I see some of their work? What is their annual turnover? Why does the ‘foundation’ appear to consist of little more than a Facebook page? Why is the company listed as ‘dissolved’? Introducing Mo Shafiq as the Chief executive of a ‘foundation’ implies credibility in a way that ‘A Muslim from Rochdale who isn’t at work right now’ does not. It also gives the impression that he has actually done something of note. Next time you see a media outlet platforming him in this way, feel free to ask them what research they have carried out on this mysterious organisation he claims to represent. Notice the similarity of the unusual eyebrows in the 2 pictures – how they curve round the outsides of the eyes. Shafiq looks thinner in the face than Umar. But they look very similar. Could the leaders of the Ramadhan Foundation be brothers: or perhaps even the same man?